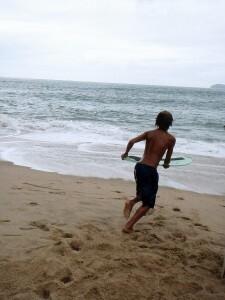 Home » Brazil » Skim to Surf: An fun alternative to paddling out. 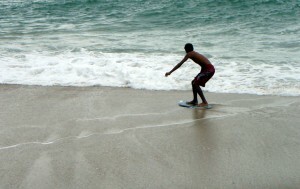 Skim to Surf: An fun alternative to paddling out. 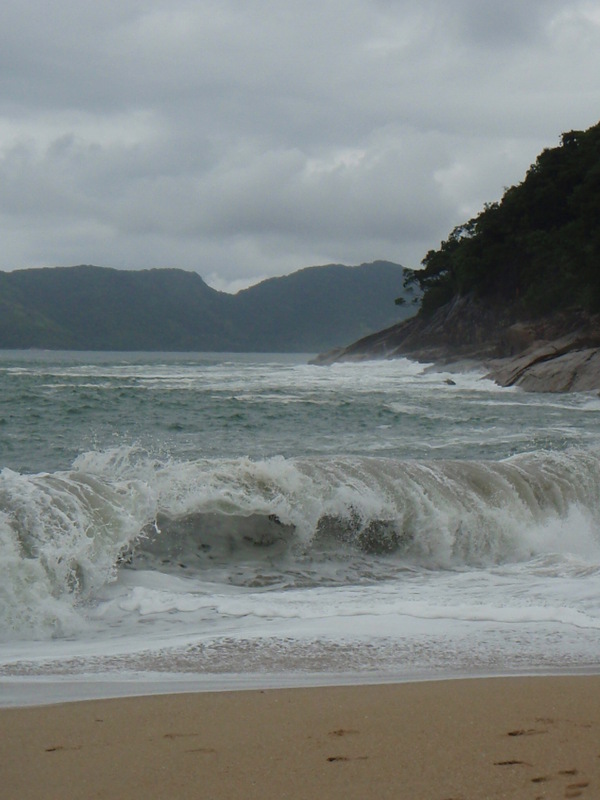 One of the highlights for me on our Ubatuba adventure was finding hidden or secluded beach in and around Ubatuba. Of course the tourists flocked to the more well-known and larger praias (beaches) of Ubatuba: Praia Vermelha, Enseada, Flamego, Lazaro, Domingos Dias, and Grande, but with 74 beaches and 15 islands, Ubatuba is a smorgasbord of beaches and we were on a quest to find a tiny beach of our own. Since our hostel was 200 meters from Praia do Lazaro we decided to visit the two tiny beaches that flanked Lazaro’s sides. The one to the northwest was practically deserted with water the temperature of bathwater. Was our search already over??? Was this our beach? We decided to check out the one to the southeast anyways, just to have a look. It was there where I found something I had never seen before but always thought possible. As a surfer, I can tell you that the only downside to surfing is the padding out, fighting past the breakers so the waves don’t engulf you before you have a chance to harness their power. I guess there’s more of a sense of accomplishment after you battle the breakers but any surfer would much rather use that energy surfing rather then paddling. Big wave surfers have the luxury of being towed in by wave runners, but what about the rest of us smaller wave surfers? Were we doomed to a life of padding? The locals enjoying this tiny beach southeast of Lazaro had the answer; the lazy man’s way to the waves and the fun. 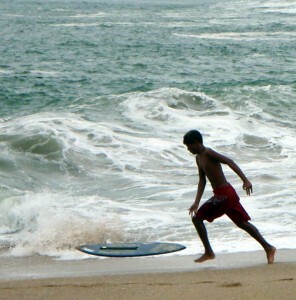 Why not skim board into the ocean instead of along side of it. Skim to Surf is what I decided to call it and ever since I saw the skim boarders in SoCal, I thought there must be a way to combine the two, I just didn’t know how. 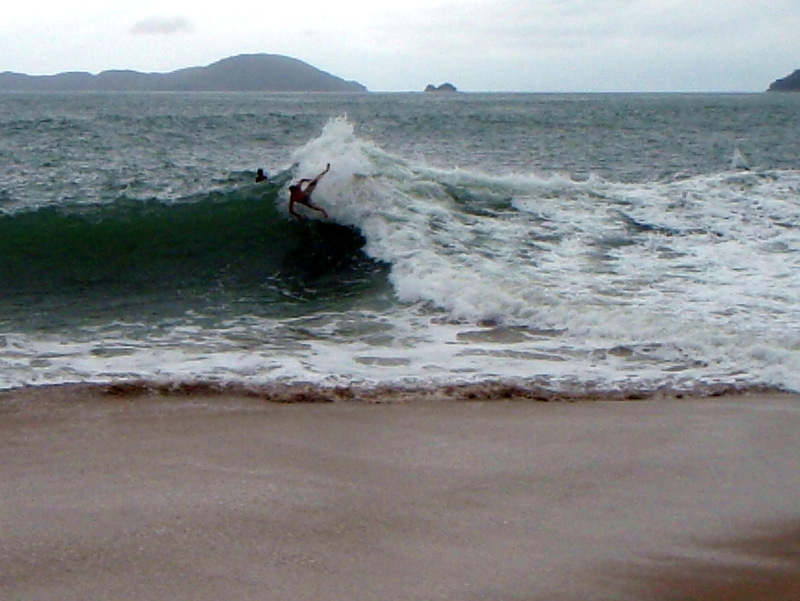 The reason the skim surf combo works here is because of a huge smooth bolder that forms a right angle with the beach. There are two waves that form here. 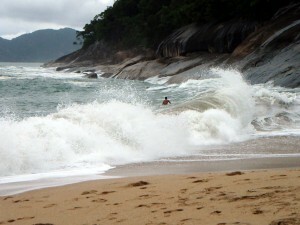 One wave that comes in parallel to shore, like any normal beach and then another wave that comes in perpendicular. This break is due to the fore mentioned bolder. 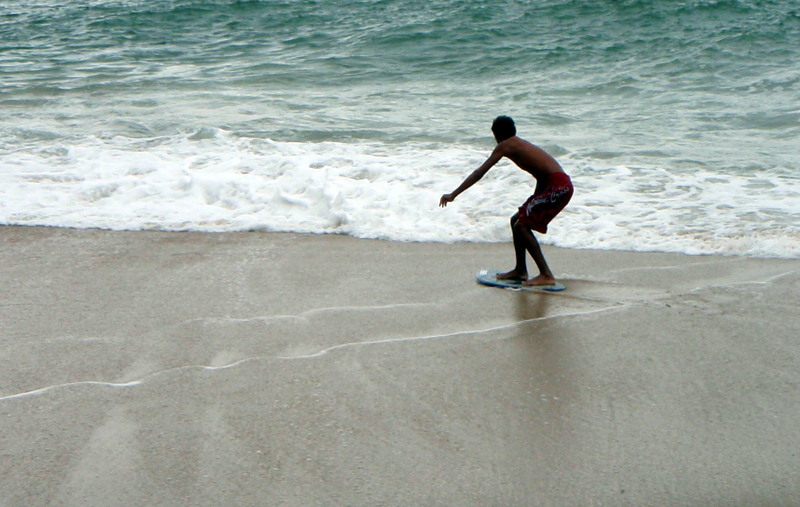 The wave that comes in perpendicular is the wave the skim boarders use to skim into. 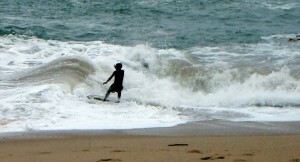 Board: It looked as if they were doing this on regular skim boards. No special board required. 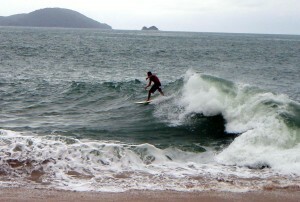 A surfboard would not work because of the fins. Warning: These waves formed a T off the main shore and where these two waves crossed seemed to get really intense. I’m sure it looked worse then it was.